We're still in recovery mode here at Casa de Bella so here's a picture of a pretty cat. Bella is doing fine. Thanks to all for the support and encouragement - you got me through a "ruff" day. We're so happy Bella is doing well. Hey there pretty kitty, hope everything's going OK over there. Glad Bella is doing better! Mom was at the vet to get more Metacam for Katie yesterday and they reminded her to make sure and give Katie the lowest possible dose, fyi. Love the eyes on that kitty! So glad to hear that Bella is doing better. Love the two color eyes of Snowflake. I am so glad Bella is doing better. Also glad that there was support for you, and that others had more information about that medication. It always helps so much with these things when others have been through the same thing, and have some knowledge about it. Keep us posted! That is a very beautiful kitty! I'm glad that the ruff day is over and I hope that you've got sunnier days ahead! 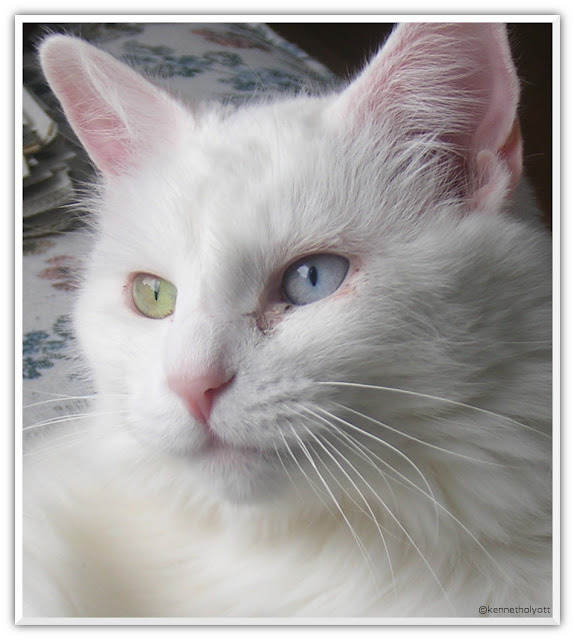 I've heard you've gotta watch out for those cats with two colored eyes. :-) Pretty cat though, even if it could potentially be "evil". LOL! Glad Bella is doing well! Those eyes are furry unusual- I love it. I just read about your awful day and am hoping things are going better with Bella. As for you, maybe a spoonful of peanut butter would help! 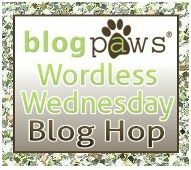 Wordless Wednesday 90 - We're going to BlogPaws! Black & White Sunday: She's such a goof.